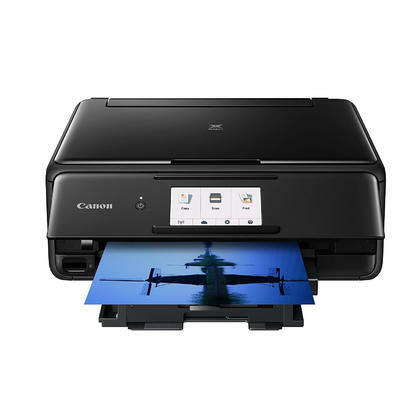 The Canon PIXMA TS8120 multifunctional printer has gained a lot of popularity amongst users that need a solid all-in-one home printer. Coming in second after the TS9120, the TS8120 will cover all of your family’s printing needs and even help you get started on preparing grandma’s next Christmas gift (we’ll get to that in a minute). With a 4.3 inch LCD touchscreen and the ability to print, scan and copy, the Canon Pixma TS8120 is definitely THE item your family needs. It does lack the option of sending faxes, but we’ve always wondered who sends a fax in 2018? The printer has a compact size, which is surprising considering that it serves so many purposes. With measurements of only 5.5 x 14.7 x 12.8 inches, you can fit this printer on any desk or in any corner. First of all, the printer is great for document printing, thanks to the 6 individual ink system. As a consequence, printing photos at a superior quality is also possible thanks to the integrated technology. You can print wirelessly from devices connected to the same Wi-Fi or you can use a Bluetooth connection. The mobile printing feature is awesome in a great deal of situations, especially when you have to print a document directly from your smartphone or tablet and someone else is using the computer. The built-in SD card reader is a great feature for memory expansion, but the CD/DVD/Blu-Ray disc printing is what really caught our attention. Thanks to it, you can easily personalize your digital photo albums and take Christmas gifting to a whole new level (what grandmother doesn’t love a personalized photo CD with a picture of her grandchildren?). Browsing through the specs of the printer, you will notice that the overall impression will be that you’re dealing with an above-the-average unit, although it is not the best Canon printer on the market. But, like we said, it’s perfect for a family’s printing needs. The printing resolution goes up to 4800 x 1200 dpi and is compatible with all sorts of paper, from plain, glossy, semi-gloss, super high gloss, matte and more. 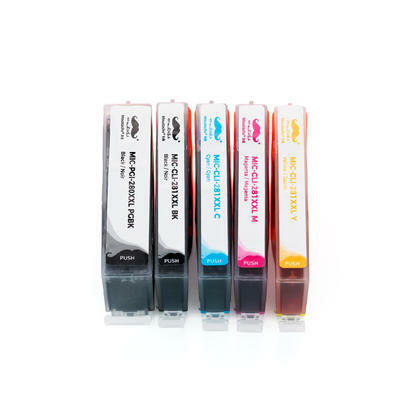 The 6 tanks combined provide both pigment and dye-based color power and the result is certainly above the average. Text quality is really good, but photo prints are truly impressive. Colors are well saturated and vibrant.